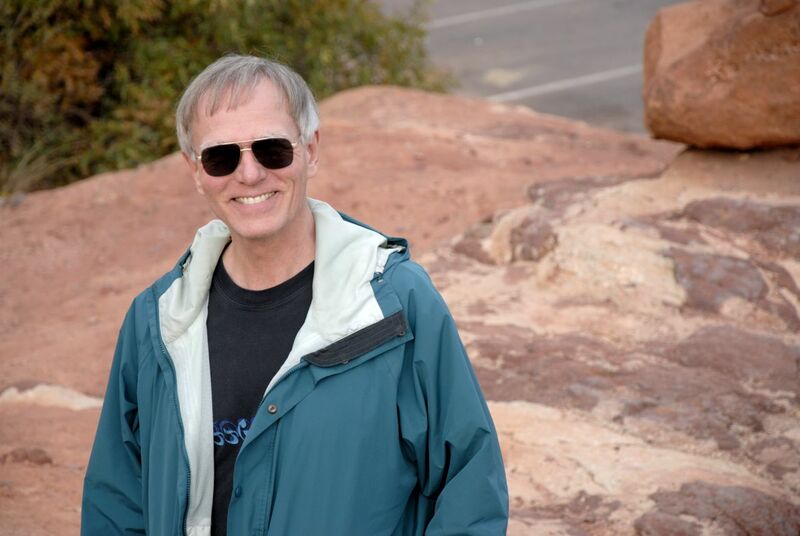 In a previous Dry Dredgers blog (Goin’ back to Tucson, 2/13/17), I introduced the vast array of fossils that are available at the Tucson Show (late January-February). It might be of interest to some readers to see the specimens that I actually acquired at the 2017 show. In that previous blog, I mentioned a room full of Russian trilobites — hundreds of caramel-brown “bugs” representing a few dozen species. In that vast array was a small grouping of enrolled specimens of Asaphus. From that grouping, I cherry-picked a few nice ones (Figure 1). While Asaphus is a fairly common genus, historically most of them at the show are prone on matrix. I’ve seen relatively few quality enrolled specimens. So when they do appear, I grab them. Figure 1. Enrolled Asaphus trilobites (Ordovician, Russia). Collected and prepared by St. Petersburg Paleontological Laboratory. Specimens are 1″ to 1.25″ across. 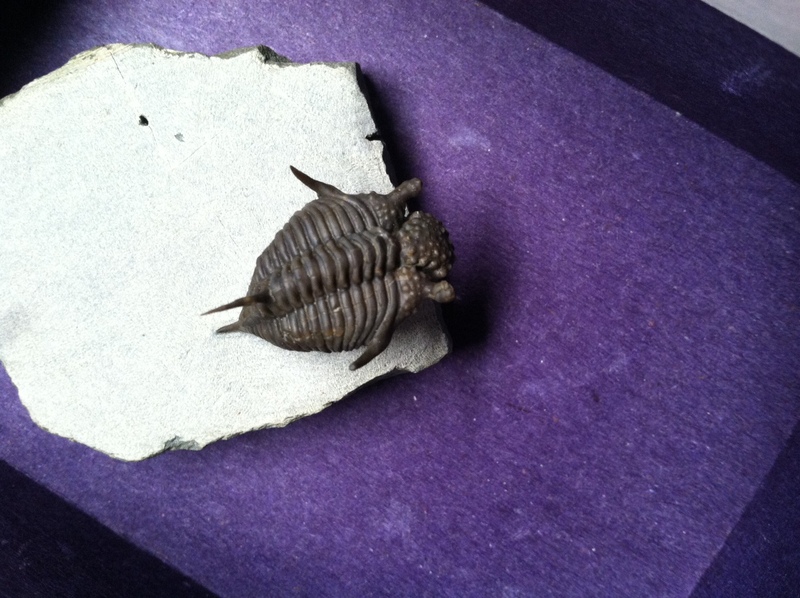 And there’s one of my favorite trilobites, Phacops. I picked up a nicely prepared partially enrolled specimen sitting on a pedestal of matrix (Figure 2). Figure 2. Partially enrolled Phacops trilobite (Devonian, Morocco). Collected and prepared by Ouhaddou Brothers from Morocco. 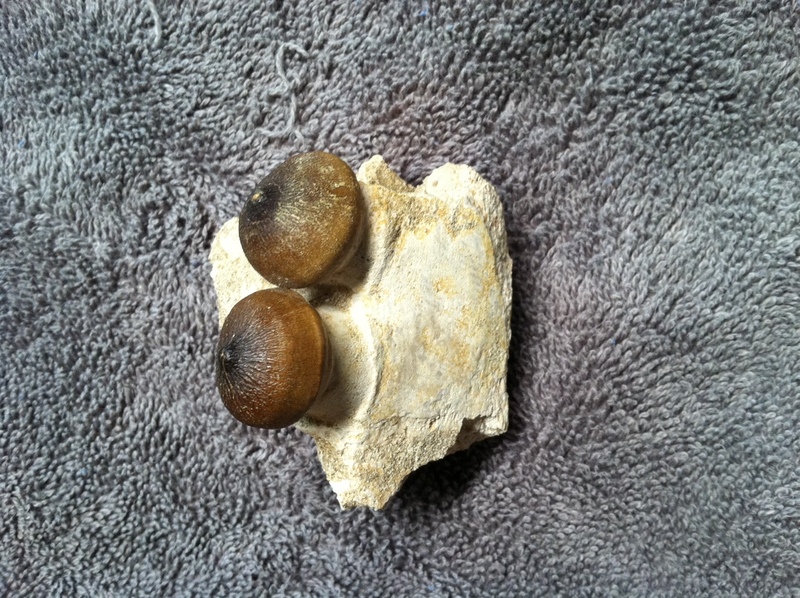 Specimen is 1.5 inches across the cephalon. Then there are the rarer ones. Only limited numbers of them appear at the show. This year, I was fortunate to get two really nice unusual pieces. 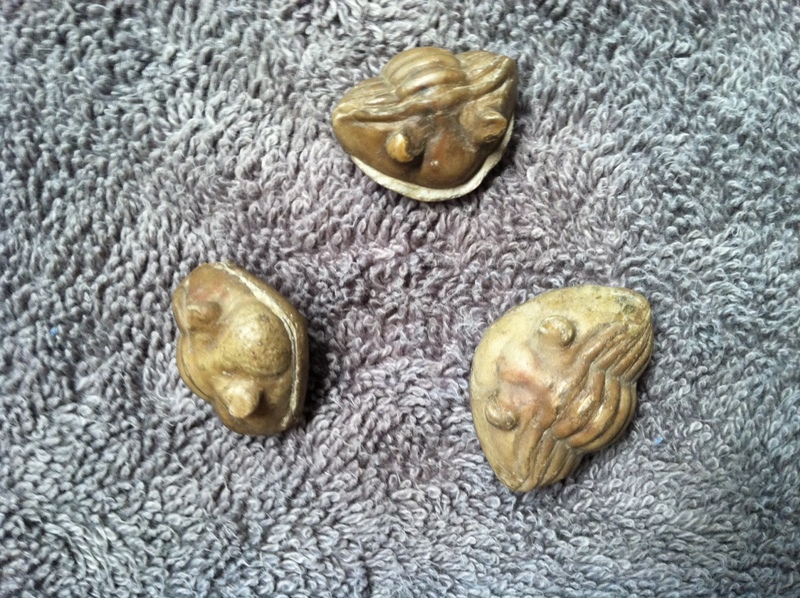 One is a red-colored Moroccan trilobite that has a very ornate cephalon (Figure 3), reminiscent of the Cincinnati Cryptolithus (lace-collar) trilobite. Figure 3. Declivolithus alfredi (Ordovician, Morocco). Collected and prepared by Moussa Minerals and Fossils from the UK. Specimen is 1 3/8 inches across the cephalon. 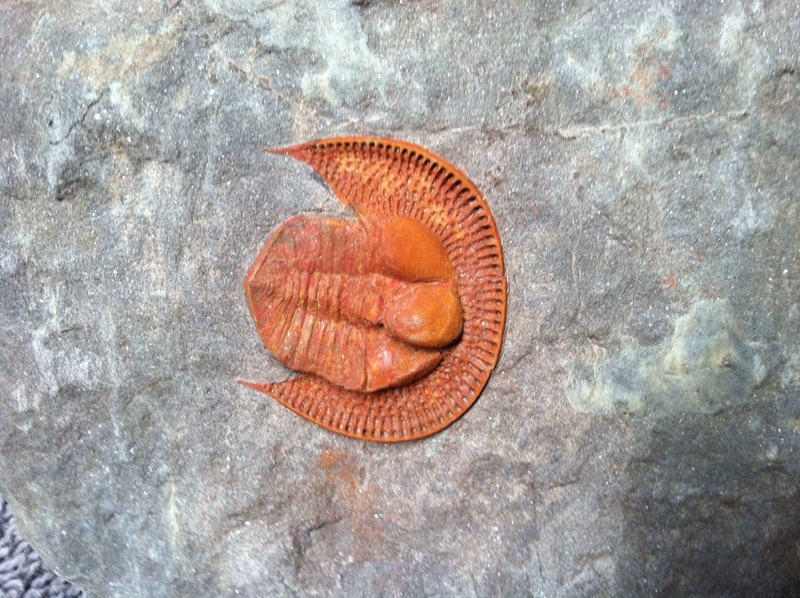 The second rarer trilobite is a spiny delicate trilobite from the United Kingdom (Figure 4). This is my first UK specimen. Figure 4. Encrinurus tuberculatus (Silurian, United Kingdom). Collected by Dan Cooper, expertly prepared by Ben Cooper. Specimen is 1 1/8 inches long. Figure 5. 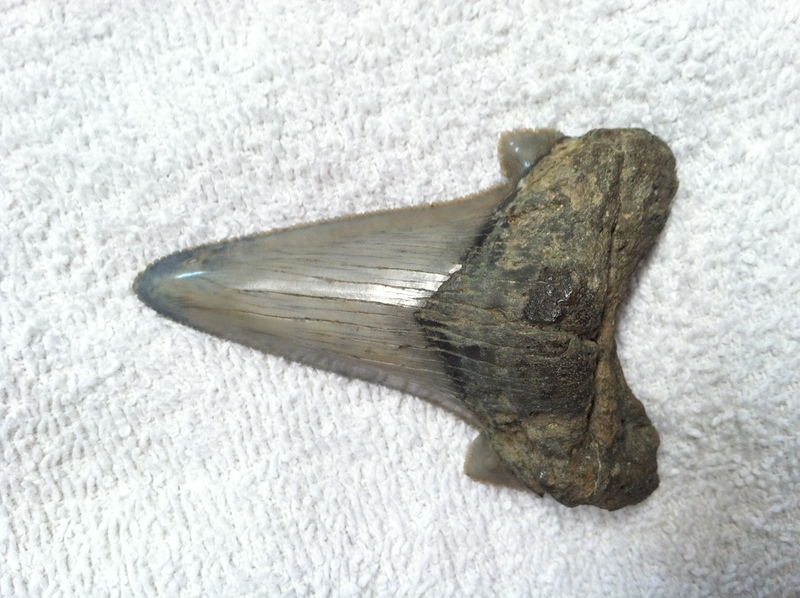 Carcharocles auriculatus tooth with intact small side cusps (Miocene, South Carolina). Collected and prepared by J&S Fossils (Florida). Specimen is 2 3/4 inches from the tip of the crown to the tip of the root. Figure 6. Colorful Carcharadon (or Carcharocles) megalodon shark tooth (Miocene, South Carolina). Collected and prepared by J&S Fossils (Florida). Specimen is 3 7/8 inches from the tip of the crown to the tip of the root. And lastly, teeth from two different genera of mososaur (extinct carnivorous marine reptiles). One is a segment of jaw containing two mushroom-shaped crushing teeth (Figure 7). 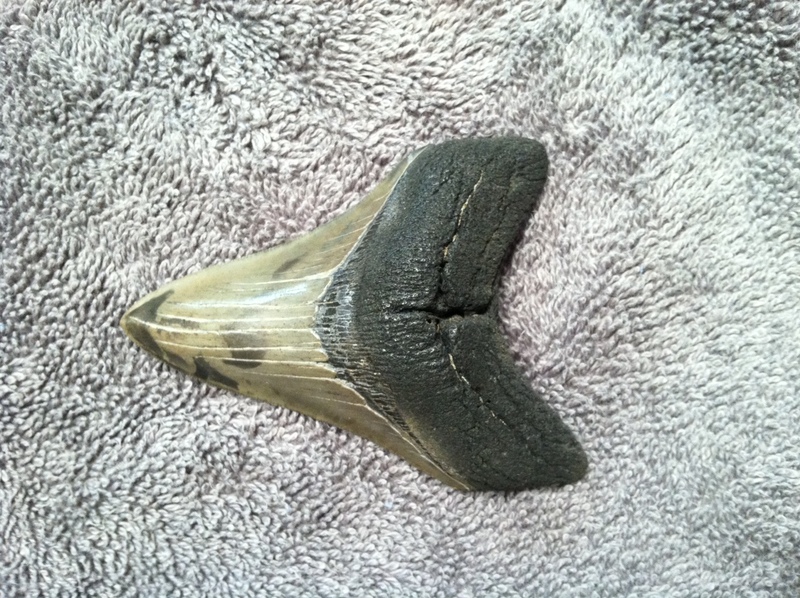 The other is a large single tooth (Figure 8). Figure 7. Two teeth from the mososaur Globidens aegypticus in a section of jaw (Cretaceous, Morocco). Collected and prepared by Moussa Minerals and Fossils from the UK. Each tooth is 1 inch across. Figure 8. 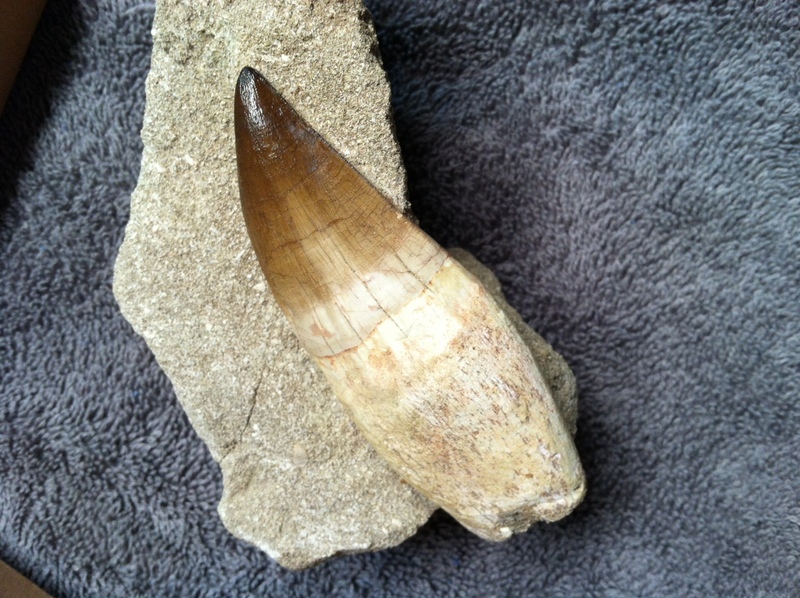 A large tooth from the mososaur Liodon anceps (Cretaceous, Morocco). Collected and prepared by Moussa Minerals and Fossils from the UK. Specimen is 4 inches long. I enjoyed my retail therapy in the Arizona desert this winter, and am already looking forward to the 2018 show! I recently found the website: Russian Fossils Saint-Petersburg Paleontological Laboratory where they sell a lot of trilobites. Have you purchased from them before? 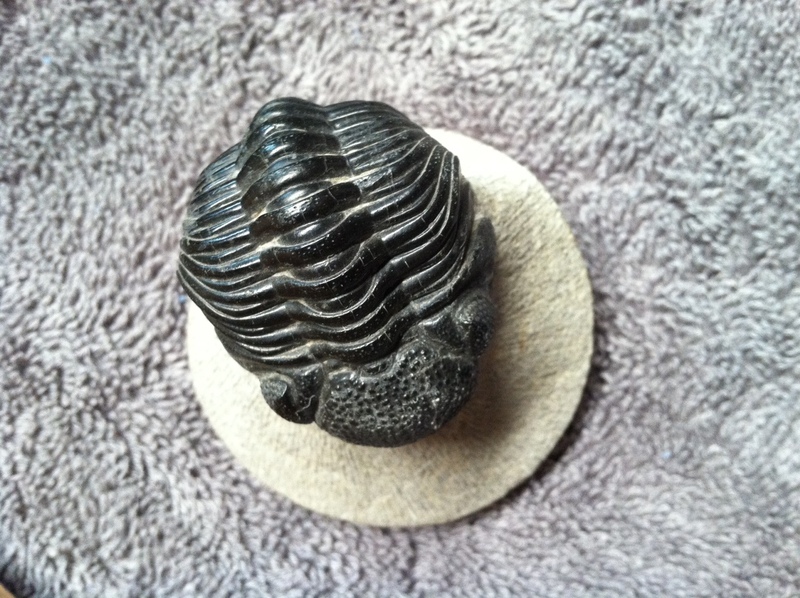 I was interested in buying a beautiful trilobite fossil from their collection that will cost $500, but I have not seen any review about the site. Is it safe to purchase from them?